Vellum stretched over board, with dark olive large italic with lavender coloured sprigs, smaller writing in green, "dilly-dilly" in pink, with raised and burnished gold dots. 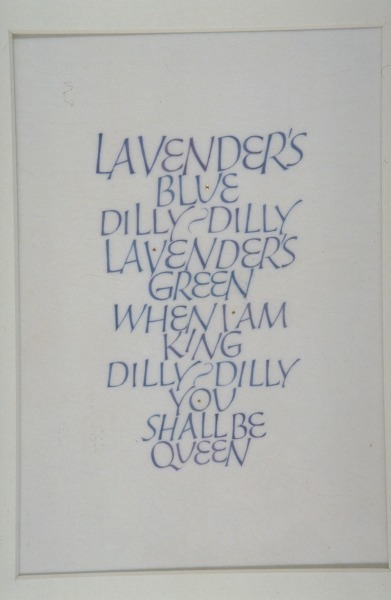 The piece reads 'Lavender's Blue, Dilly-Dily, Lavender's Green, When I am King, Dilly-Dilly, You shall be Queen.' Framed. Calligraphic and lettering work, painted onto vellum, stretched on board with acid-free card lining.